Our elementary school’s big fundraiser for the year is happening later this month: the dinner auction! Every year, this raises a ton of money for our school, which helps fund our teacher’s aide salaries and buy technology for the school. A few years ago, the PTA auction raised money to put Smartboards in every single classroom! Parents look forward to this fun event, and the volunteers work so hard to make sure it’s amazing for everyone involved. This is the third year that I’ve done classroom auction baskets. Each classroom creates a themed basket for the auction and parents engage in bidding wars! In years’ past, I’ve done a Minecraft Auction Basket, a LEGO Auction Basket, and a Steve Spangler: Science is Fun Auction Basket. This year, my kids are in 5th grade. It’s my last hurrah as an elementary school volunteer, so I decided that this year’s basket would be geared more toward the parents than the children. Naturally, I decided to go with alcohol! I kept thinking of different cocktail themes that would be fun – cosmos, margaritas, mojitos…but eventually I decided that JELLO SHOTS would be a big hit! After I collected money from all the parents, I went shopping! I found a stellar deal on flavored rum, and I was really excited to see that I could buy a bottle in every color of the rainbow. 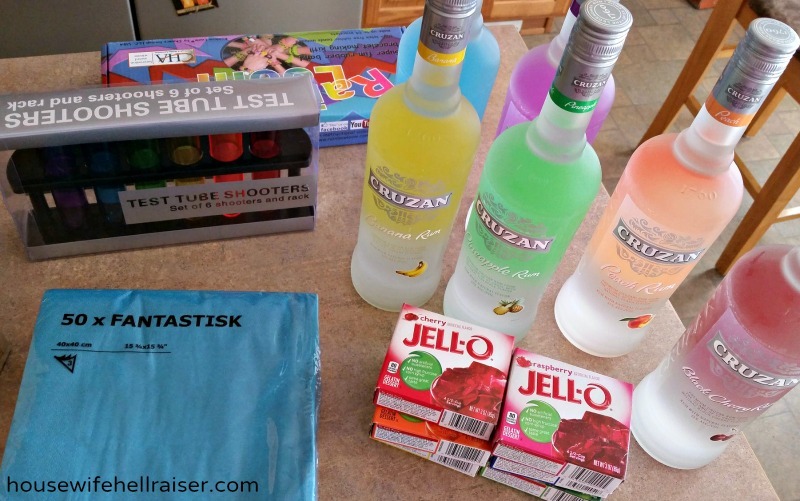 After I had my rum, I hit the grocery store and bought matching Jello – all except for purple! Apparently grape Jello is only sold around Halloween. Who knew. So I had to sub raspberry magenta Jello where the purple should have been. The liquor bottles fit perfectly in a wooden wine crate, and I filled up the extra space with Mason jars for mixed drinks, cocktail napkins, and the most darling rainbow tooter shot glasses . Just for fun, I threw in a Rainbow Loom set too! I painted this fun sign for the basket, using acrylic paint and an old piece of fence picket. The hanger is made from twisted floral wire. I think it’ll be cute on someone’s bar top during a party! I hung the sign from one of the bottles inside the basket. For packing materials, I used basket shred and a large cellophane bag designed for a gift basket. Getting it inside that bag was tricky, let me tell ya! My advice: have a friend help you. This is a two person job! I do wish it wasn’t so difficult to get a decent picture of a cellophane-wrapped gift basket! The glare isn’t so obvious in person. Filed Under: Crafts, Fun Stuff, I Made This! Tha is such an awesome themed basket Laura! Shots to go!!!! Thank you for sharing! How much did it end up raising? You know, I’m not sure what the total was – that was a whole separate part of the auction committee. I am looking to do make a similar basket. How much did you sell raffle tickets for? I am having trouble finding the colored bottles!?!?! Where did you get these? I went to a larger liquor store in my city. The smaller shops don’t have as big of a selection. Minecraft and LEGO Auction Gift Baskets! 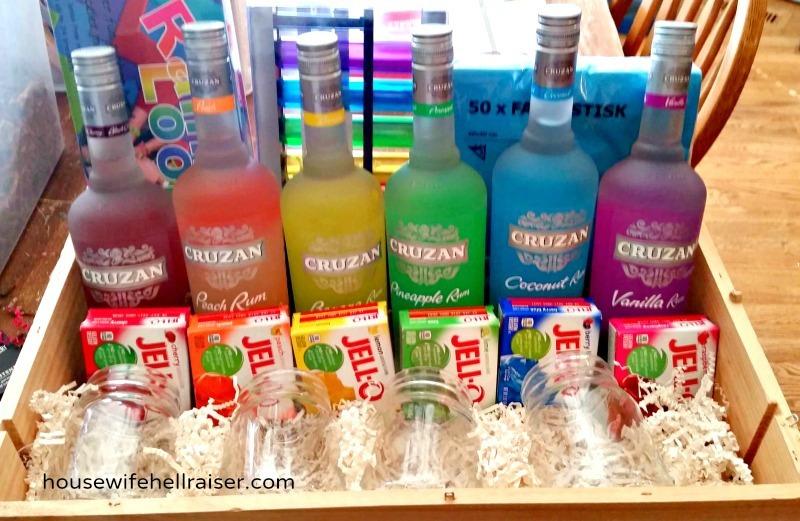 Fundraiser Auction Baskets – 10 Great Gift Basket Ideas!